For the perfect final touch, ice your cakes with this Ateco 1307 medium size offset baker's spatula! With a durable, hard polypropylene handle and a taper ground stainless steel blade, this spatula allows for precise edging on frosted desserts. The polypropylene handle provides shock resistance and is easy-to-clean, making it a sanitary option for your kitchen. Because the blade is slightly bent, you can easily round corners and follow the natural form of round cupcakes and tiered cakes to evenly distribute icing. With the proper tools for each task in the kitchen, you can create professional, appetizing desserts that are sure to catch your customers' attention! We use these to ice our ice cream cakes. They are inexpensive and they work as we want them to. Dependable without surprises. Just like you want. These are very sturdy! We use these for putting frosting into bags as well as mixing buttercreams. They hold up very well to rough use, especially on our thicker frostings like cream cheese when it's cold! Not enough good things to say about this spatula. Use it every day. Other than in just baking! It is sturdy, well built and of course Webstaurant Store offers the best price. The Ateco medium size tapered offset spatula with my everyday spatula. I use it to ice cakes, smooth them and even blend food coloring for into buttercream! We use this spatula every day since 4 years now in our french bakery. Very useful ustensil and easy to clean. Made with solid material. Great spatula from a great name brand. Much cheaper than you would find at stores. It works great with even stiff buttercream and cleans well. These last much longer than the wood handle counterpart. The plastic won't break down and it's a perfect kitchen tool for use everyday. We recommend it. 7 3/4 size icing spatula was what I was looking for all this time. Perfect grip and sturdy and makes icing very easy and breeze. As always prices are great. High quality offset spatula. these are the perfect size for icing sheet cakes of a medium size. We use them for all of our cakes. Smooth offset, perfect size. Using it from chocolate work to just spreading cream on to a tart shell. The handle is a great color so when I use my color tape to identify it from the dish pit. Typical offset spatula. I like the longer blade and it has come in helpful many times with cake and cupcake decoration. Certainly a must have basic tool for any baker. I cannot go a day without this item, it is perfect! Sturdy construction let's you lift cakes with ease and the length of this spatula makes frosting even mile high cakes a breeze! This offset spatula is great for geting to those hard to reach places. When making cakes, this is a must have. One of the staples in our kitchen. This is a great quality off set spatula. It’s made with great quality and holds up for a long time. This brand has great products. i've been using this Ateco Baker's Spatula for awhile and it's great. It's flexible/bendy and long enough to frost a 9 inch layer cake. It's held up well. What can you say bad about an offset spatula? They are essential to any baking operation. Ours are used all the time and i don't see them failing anytime soon. LOVE this! And it was necessary. We began a cake baking class at our church and were using knives to frost the cakes! That's a NO NO! We ordered this and VIOLA! Going to purchase several more. This is a great size (length 73/4) and feels good in the hand because it is offset. Martha Stewart uses an offset spatula all the time! This is where we got the idea to purchase. Another great by from Websstaurant. We are planning to purchase 5 more for the class! This spatula has been used for a variety of things. Its excellent for icing a cake as well as dishing out brownies or pie. Very heavy duty. The offset spatula by Ateco is the perfect size for decorating an 8" cake with buttercream. It fits inside a Nutella jar and a smuckers jam jar so I don't need to use a butterknife. I am able to add buttercream frosting, Nutella, and jam using this Spatula. The brand is reliable and the product can be used for a variety of uses. This cake spatula is absolutely perfect. I use it for frosting cakes, serving cakes and pies, and scooping cookies off of a pan. The thin but sturdy blade makes this thing capable of many uses. Awesome, awesome, awesome spatula! I used it to decorate a large 6 inch cake and it worked beautifully. It's flexible enough to make icing comfortable but stiff enough to handle a lot of buttercream. No baker should go without an offset spatula and this one works very well. The design and style makes it easy to ice any cake with confidence and clean up a breeze. This offset spatula is perfect for decorating cakes. The handle is nice to hold. We've also found other uses for it, such as releasing egg muffins from muffin pans! Hah! The handle feels comfortable in my hand and the blade is large and smooth. This tool makes it easy to frost cakes quickly and effortlessly. This is a great product. I can find a lot of different things for this item in my kitchen. This is a very sturdy product. I love this spatula! It is huge. The length and width will be perfect for helping me to smooth out butter cream on my cakes. 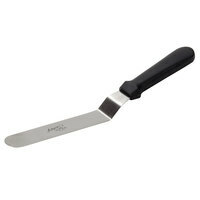 The Ateco medium size tapered offset baker's spatula is great for frosting or slicing cakes. The handle fits comfortably in your hand and the blade is pretty sturdy. The medium Ateco offset spat is my go-to when icing cakes and smoothing battersb before a bake. The handle is sturdy and will last over a long period of time. I've used mine everyday for a year at my restaurant and it's still going strong! Great spatula for larger cakes. Spreading filling or getting the crubs coat on is a breeze with the off set spatula. I don't like it for finishing work but I think that is personal preference. I think it has a little too much flexibility for me for finishing. Ateco is my favorite brand, and these offset spatulas are great for smoothing out cakes, royal icing or ganaches on cookies or cupcakes, the handles are great as well which is something other companies don't offer! These are great - we like the plastic handles because they clean so easily. They're pretty flexible, which could be a good thing or bad, depending on what you're using them for. Very essential tool with icing and even slicing cakes. It's just the right size and easy to handle. I definitely need to order more for back up and when icing multiple cakes at one time. Great offset bakers spatula for great results with you baked good! Great quality and price. And just a perfect size for most kind of possibility of usage. This Ateco 1307 medium size offset bakers spatula is an all purpose tool. I really like using offset spatulas when icing cakes. Gives you more control. This is a perfect spatula for spreading frosting. It'll make an even layer in no time, and looks nice in both commercial and home kitchens. A great little paint brush set. The brush stays intact, doesn't "shed" and I like that it is not a wooden handle. It can be left in water and not peel or get ruined. Good purchase. Great offset spatula from Ateco. The 7-3/4" size is just right for icing cakes as well as other uses, like applying sauces, or spreading batter. construction is of good quality and the handle has a nice feel in hand. Fabulous offset spatula with a handle designed to work better with your hand. This essential tool helps to ensure that my brownies and cakes are completely even before baking! I have also used to expertly decorate cookies and cupcakes. This design carries a little more heft than the Ateco wooden handled version (#1385). Ateco makes fabulous products, period. Have seen the same offset spatula with a much higher price tag elsewhere. Don't just buy one...buy two. I love this little guy. Despite its small size it works well to wiggle out stuck brownies, frost smaller cakes, and is just in general handy to have around. I was looking for the same size made of wooden handle... good size for cake decorating and well made. My only complaint is that it came with very sticky sticker on the metal part ....very hard to take it off. I used this almost every time I bake for a catering event. It is just the right size. It holds up to everything I use for. It doesn't bend out of shape but it is flexible. I was even thinking about getting another one. This product meets my business needs. It is of good quality and at a great price. It cleans up easily and seems like it will last a long time. The best spatula ever to frost cakes. I'm so glad Webstaurantstore carries Ateco products because usually it's about double the price to buy it elsewhere. Its the only spatula I use every time. It's very small and handy. I actually take it anywhere I go. The quality of metal is very good, sturdy and easy to clean. It works great for icing cakes. Even my 13-year old likes using it. Does the job well. Quality is good. Up to par with Ateco products. This is a good offset spatula. The Ateco brand is always a good quality product. No surprise that you can find it here for a lot less money. An essential tool in my bakery to get cake edges smooth. I like the feel of the offset spatula for spreading icing and like all Ateco products this is well made. Hello, I went to my first baking class on August 12, 2016 and in that class we made a 8x2 cake. This product made it so easy to flatten and smooth the top of the cake. I highly recommend this product and I am exited to finally own one my self! Anyone who decorates cakes needs this spatula! I don't know how people can do it with a straight spatula. I love this angled spatula and I can't imaging icing a cake with anything else! Ateco is a wonderful brand. This spatula is inexpensive and works great. It's easy to use, especially if you are new at cake decorating. I highly recommend it. This is the perfect item for frosting a cake, removing fudge, removing a brownie from the pan, and getting under a small piece of pie where a larger spatula won't work. A trick for getting the first piece of pie out easily and neatly. Cut two pieces, then remove the first one you cut. It comes out easily. The tapered offset spatula is a must have in anyone's kitchen. Great little offset bakers spatula. It provides a nice smooth finish to our smaller cakes and cupcakes The price was very affordable and shipping was fast. This spatula makes spreading buttercream very easy. You just need a little practice and it helps you do a fabulous job. Keep them coming Ateco!! This is a great sturdy spatula. I use it regularly at our catering company. I would highly recommend it to any and all cake decorators! Love love love this little spatula. It's so thing and flexible yet sturdy enough to push into tough little spots and wiggle free any stuck baked goods. Definitely happy with this offset. It has just the right amount of give and after using one that wasn't fully straight this is a serious improvement! This little gem has all sorts of uses in our kitchen. From spreading toppings to serving small slices of dessert, this handy kitchen tool is worth the money. The Ateco 1307 Medium Size Offset Baker's Spatula with 7 3/4" Blade (August Thomsen) is perfect for icing cakes. The angled handle is just what you need for keeping your hand icing free! A must for pastry service at the dessert station. Well made with just the right springiness in the blade to get cakes and tiramisu out of hotel pans and onto a plate. This spatula is perfect for icing smaller cakes. It's especially suited to smoothing those top edges and the angle keeps your hand from touching the icing. A great cake decorating tool. It is very well made and comfortable grip. It also holds up well to dishwashing and hand washing as well. Perfect little offset spatula. I use this mostly for taking flowers off of flower nails when piping roses, etc. Also works great for smoothing icing and frosting. Integral tool in my cake decorating! I use this to ice all my cakes before smoothing with a scraper. It's also useful in lifting a cake by its cake board just enough to slide a cake lifter underneath. This is a much bigger size than we expected. Good for bigger projects just not if you need it for delicate areas. Other than that, they have held up so far. I have two of these, I can't frost a cake with out my spatula. It makes smoothing anything much easier. I even use it when I make pancakes. Offset Bakers spatula from Webstaurant is a great deal. Extremely worth the money as this spatula is extremely durable and works great for many applications. well designed. very functional. easy cleanup. good grip for working the frosting on anything from full size cake to smaller cupcakes. very pleased with the item and would recommend to others. This is a good all-purpose size for an offset spatula. Good for making small to medium cakes. You might want a larger one for large special occasion or wedding cakes, or a smaller one for detail work, but this size should meet about 90% of cake decorating needs. Seems sturdy, feels good in the hand. Overall, quite satisfied. Great quality, sturdy offset spatula. Holding up well with multiple washes. I used it for spreading/smoothing batters and icings, lifting/ de-panning delicate cookies, and more. This spatula was recommended to me on a website to help with smoothing out the frosting on the top of my cakes, it definitely works. Leaves a nice smooth and clean edge if used properly. Dishwasher safe, flexible but not too "bendy", good grip with offset so my big knuckles aren't dragging on things when you get around to the twentieth cake your still frosting. The most favorite "spreader" in my chef bag. Also good for flipping blinis, croutons, or mini pancakes for my boys at home! These are really great for spreading out mousses and sheet cake batter on a half sheet tray. Very easy to handle and control compared to the longer blades. The work horse of any pastry shop. These offset spatulas work wonders. The handle is well designed making using the spatula for hours a breeze. After years of use I have yet to have any of this spatula bend or break. No Pastry kit is completed without 4 or 5 of these. The Ateco offset spatula is a great buy! Sturdy nice grip easy to use. I would recommend it - five stars for this super product! I like the length of this spatula. It really makes it easy to spread icing nice and smooth. It also is easy to handle - the offset bend is perfect. I also have a straight blade similar to this one and I prefer this offset one hands-down for most projects. I bought this for cakes and cupcakes. This size is definitely a bit long for cupcakes, but that's my error. Overall, a great, durable, dishwasher-safe product that does the job. I wish the manufacturer would move the sticky label to the handle, not the blade, though, because I STILL have a little residue on the blade from it. Hasn't harmed my baked goods, though. Very easy to handle! I use this to ice most of my cakes. The grip is perfect when working with some of the messier icings. Very nice handy little spatula, very good for icing medium to larger cakes. It as a good flexibility to the blade but store it carefully as it can get bent. The size of the spatula is good, but the quality leaves a little to be desired. There is a substantial amount of bend in the metal that makes spreading an even layer a little more difficult. Really high build quality. Perfect offset angle for either icing cakes or picking up pieces from a pan or plate. Is able to withstand the high heat of a cast iron pan. I love it. Great for what I need. Can easily ice cakes as well as use for spreading butter on my bread for grilled cheese sandwiches. Need to buy one more. As far as offset spatulas go, Ateco is the best brand quality for an affordable price point here on Webstaurant. This 1307 Medium Size offset spatula is ideal for decorating 8inch cakes and larger. I use this whenever I decorate or to help me serve desserts. I love these small offset spatulas especially for my recent experimentation with a smooth buttercream technique on cakes that involves spreading horizontal layers of different shades of the same color (ombre effect). Along with a good bench scraper, these small spatulas are perfect for that. They're just generally perfect for getting into small spaces, fixing small frosting mess-ups, or frosting cupcakes in a rustic style. well built and very useful little tool. We use these for so many different task. It is a great size that is big enough for full cakes yet small enough for fine detail work. The Ateco 7 3/4" blade spatula is very nicely made, with a good weight. I'm a home baker so I felt a little silly ordering something so long at first, but it made a big difference when frosting a cake. The blade is tall enough to smooth frosting on a tall cake without having seams. This is my go to offset spatula- I use it to ice all of my cakes, it's the perfect size for my hand- I've bought a bunch to have at the ready! This product is great for getting cakes off of a pan as well as slicing it if you need to. I use this all the time and it holds up very well. This is a very well made product. Although a little large for our needs, it ices cakes well and washes up nicely in the dishwasher. I would recommend this product. Really high quality spatula. Ateco is synonymous with quality and this is no exception. I use it to spread filling between cake layers, and also to level off the batter in the cake pan. I absolutely love this spatula! I use it to scrape the icing out of the bowl into my piping bag. It is the best when spreading icing onto the cakes I make! I'm very happy with this purchase. This is a very useful tool for basic cake decorating - absolutely essential, cleans easily, and comfortable to use. This offset spatula works extremely well for spreading custards, ganache, frostings, and other similar fillings on cakes. I've also used it to fan out thinly sliced vegetables on the plate ala Confit Byaldi. It's held up well in the dishwasher, which is an added plus. It's amazing how an offset handle can make all the difference when smoothing out frosting or cookie dough. Much better than a regular spatula or knife. This spatula works greats and does the job well. Handle feels good in your hand. Very happy with this purchase. Feels good in your hand and is easy to ice large cakes with it. Can also use it to lift and move small cakes. Well worth purchasing. This is the perfect size spatula for doing the sides of smaller cakes or cupcakes. The smaller size makes it more comfortable to get around edges. This is a perfect tool for spreading icing, glazes, or even polenta. Also really good for flipping seared items in tight spaces where other spatulas won't fit. This spatula is great for the table method of tempering chocolate. It's perfect for the small amount of chocolate we make. I recommend it be stored in a knife box and not a kit or bag because you do not want it to bend because then it's not good for icing cakes. Very nice quality spatula for the price, and it's the perfect size to smooth frosting on smaller cakes and also to create decorative ridges in the frosting. I like this spatula for the number of tasks it can do in the kitchen! It is perfect for decorating small cupcakes! I like it for picking up delicate items! Good buy. These come in really hand in the bake shop. We use for all kinds of things. From frosting cakes, smoothing icing and even lifting cakes. Very useful. This offset spatula makes it easy to pick up delicate items like chocolate garnishes. Its also makes frosting cakes a piece of cake. Good deal. At 10 inches long (with a 7 3/4 inch blade), this spatula is great for not just frosting cakes but also cutting items (like brownies) without scratching pans the way knives do. I love the width and edge on this spatula. It has a nice sharper edge so it makes the buttercream lay down very nicely. The grip is also small enough for my hand so I don't have as much fatigue. Im a baking and pastry student and these spatulas come in handy all the time. You can use them on almost everything, cakes, cookies, brownies, frosting etc. A must need in every bake shop! I have at least 5 of these just for my baking needs. I use them to loosen up cake edges in the pan and to spread Icings and Fillings.Very useful and keeps your fingers away from the cake surface so you don't smudge the smooth icing. I've got several of these offset spatulas around the bake shop. They are really handy. They're awesome for smoothing out frosting on a cake. great buy. This is a wonderful product and at such a great price! A perfect size for all decorating needs, works wonders with the ateco revolving metal cake stand and decorating comb, also featured on webstaurant. When you need to apply and smooth frosting, this is the tool! We have all sizes, but the medium size is probably the one we use the most. This spatula is perfect for frosting cakes. We also use it at our bakery to remove cookies from parchment paper. A must-have item for any bakery!